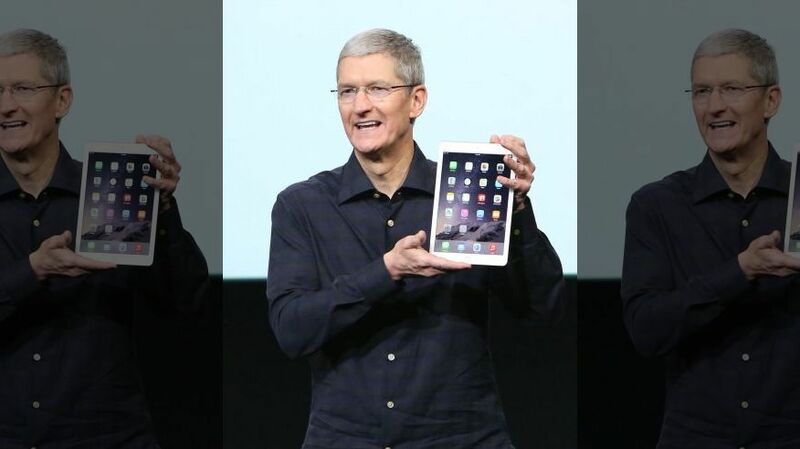 Apple CEO, Tim Cook, showcasing the i Pad Air 2. Apple is active, effective and energetic again but marked by incremental exercises in creativity this time. No big announcement(s) or pathbreaking ideas. Last month Apple unveiled iPhone 6, iPhone 6 Plus, and iWatch in a glittering ceremony. Yesterday, it unveiled its new tablets ( iPads ) – iPad Air 2 and an iPad mini 3. Also on show was the new iMac with a 27″ retina display. Touch ID sensors on iPads; Retina HD display; NFC tech supporting mobile payments ( Apple Pay ); anti reflective coating added to the display making 56 % less reflection than other iPads; and an enhanced iSight Camera which can take ‘burst’ photos for the first time on an iPad are the main identifying features. All these are available for Pre Order on October 17, 2014. Delivery by end of the week. iPad Air 2 with 16 GB is available for $ 499; iPad mini 3 with GB for $ 399; New iMac is available for $ 2499. Concurrently, prices of iPad Air and iPad mini 2 have been reduced by $ 100. Apple CEO, Tim Cook, said while introducing the new devices : ” Simple, Magical Device “. He also added that, ” Since the 2010 launch Apple has sold 225 million iPads; i.e. more than any other in the first four years in their history”. Proof of its astounding performance ! 1. A graceful and pleasing event; not much pomp, show, or shtick to brainwash people and it remains to be seen whether people take what Apple wants them to. 2. General enthusiasm for tablets is on the decline. Product acceptance is usually measured by sales growth in the days/quarters to come and that will spell the token of the improvements being perceived as valuable. Product improvements have to used. In the last 2 quarters, however, sales for iPads had declined, even if marginally so. We probably have to wait through a sale cycle to be on course firmly on this. 3. Sales, generally, can be increased by getting existing users to get attracted to the new iPads OR by finding new users and uses. Having a strong hold on the Education segment, Apple may well promote aggressive market expansion coupled with profitability objectives rather than volume sales. This will perhaps be the key strategy. Events and circumstances, hopefully, may not be hard on Apple to be good for its set limits. Tidbit : ” You can’t make progress unless you stick your neck out “.